Are you like is and think of yourself as being a bit of a couch potato? Is this something that you are trying to change? We all know that we should be exercising daily for our general health and wellbeing, but this can be easier said than done. However, one of the easiest ways to incorporate fitness into your everyday life is to introduce fun sports that you actually enjoy! Here, we are taking you through some of our top picks when it comes to fun sports activities that will also help you to improve your fitness and reach your goals. Many of us reserve swimming only for the pool or the sea when we are on holiday, but swimming is actually a fantastic sport to try out all year round. What’s great about swimming is that it is cheap and even swimming at a moderate pace can help you to work your entire body including your arm, legs, core and glutes. For the average person at 130 pounds, swimming can help you burn a massive 434 calories. What’s more, some types of kayaks have pedals and so you will be able to improve your leg muscles and burn more calories. If you are unfamiliar with the best type of kayak to buy, you can head on over to https://bestkayaks.reviews/. This site will provide you with the information that you need to choose a top quality kayak. We’ve all been glued to our screens this summer watching Wimbledon, but have you ever thought about a taking tennis up yourself as a fun sport? Tennis is a great way to both burn calories and socialise as you will need to bring along a few friends to play. A casual game of doubles can burn around 370 calories for a 130 pound person and it can also help you to develop your agility! 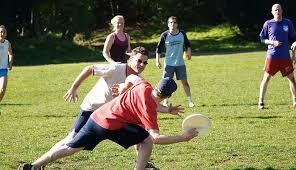 A sport which has been rising in popularity in recent years is ultimate frisbee! For this, all you need is a group of people and a park which you can head to for free. This is an amazing sport to increase your endurance with all the running that you will be doing. Do these sports sound fun to you? Then make sure you check a few of them out and see which one you enjoy best as you embark on your own personal journey to a fitter and healthier lifestyle.